Google is giving Gmail a new right-click menu. And it’s about time. While you’ve long been able to right-click on any email in your inbox, your options were always limited. You could archive an email, mark it as read/unread and delete it, but that was about it. 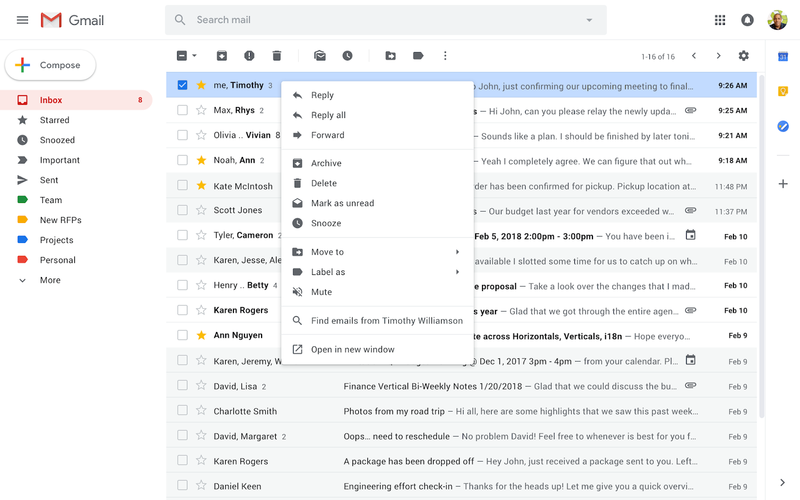 Now, as the company announced today, that’s changing and you’re about to get a fully-featured right-click menu that lets you do most of the things that Gmail’s top bar menu lets you do, plus a few extra features. Soon, when you right-click on a message in your inbox view, you’ll see a long list of features with options to reply to messages and forward them, search for all emails from a sender or with the same subject, and open multiple emails in multiple windows at the same time. You’ll also be able to add labels to emails, mute conversations and use Gmail’s snooze feature, all from the same menu. All of this is pretty straightforward stuff and none of it is especially groundbreaking, which makes you wonder why it took Google so long to implement this. As usual, Google only tells us that it is rolling this feature out to G Suite users now (starting today for those on the rapid release schedule and on February 22 for those that follow the slower scheduled release cycle). But free users typically see these new features pop up somewhere around that same timeframe, too. Posted in Software Development and tagged Enterprise, gmail, Google.